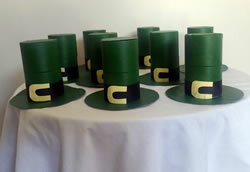 These little Leprechaun hats look great as a mass display or as table centrepieces for any Irish celebration including St Patrick’s Day on 17th March. The photos show the finished hats, the items needed and how to construct the hats. All items are available at dollar or at party supply shops. 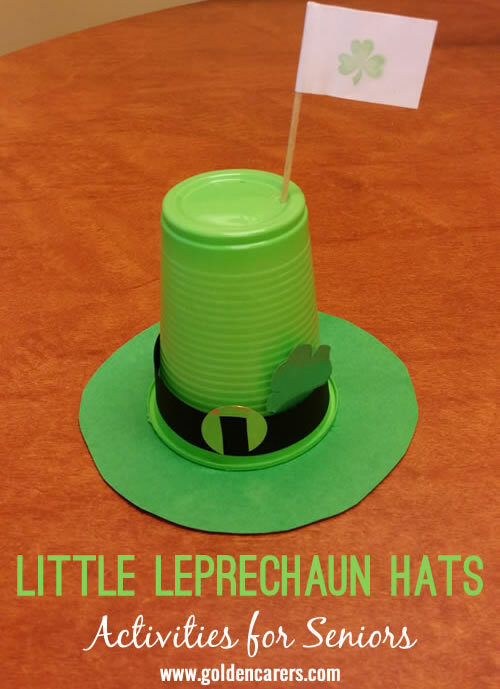 Also look for small Shamrock stickers or mini toothpick flags in the lead up to St Patricks Day to use as hat decorations. Use a saucer or small plastic bucket or other round object as the template for the circle for the hat brim. Have the circles already outlined for elders to cut out. Pre cut the 1cm x 20cm black paper strips as well for elders. If using green paper rather than cardboard, try laminating the circles before gluing down the upturned cup. It will make the hat more robust and durable. The gold belt on the hat is made by cutting two small slits in the round gold sticker and then threading the black paper strip through. Alternatively cut a small buckle shape out of gold cardboard and stick in place. Two small Shamrocks are stuck to the small piece of pipe cleaner. Use a small template of a Shamrock to cut them out of green paper. I used a small hard plastic one from a previous decoration. The 10cm piece of pipecleaner (or mini flag )is put through a small hole made in the top side of the upturned cup using a push pin. In the interests of safety, it might be wise to pre prepare the hole for elders. Take photos of elders participating and of the finished hats and display the results. Elders always take pride in their efforts and like seeing their crafty decoration creations used or on display. They look very effective, thank you. Our attempt at making Leprechaun Hats. We will be using them as table centerpieces in the dining room. So much fun to make. Good fun - and cheap to make too - Thanks Astrid. Love it!! Thank you Astrid!